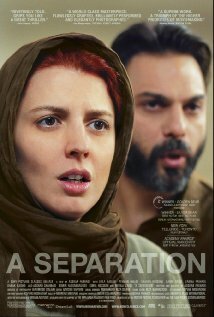 Why “A Separation” by Asghar Farhadi is perhaps the best film of the past five years. There is a scene a third of the way through Asghar Farhardi’s latest drama/mystery/family saga when the audience witnesses a death. At the time, they do not realize it. Or perhaps they do? The scene replays itself at the end when another death is implied, but has apparently already occurred off screen. Is either a murder? With these Hitchcockian book-ends framing his latest drama, Farhadi draws the viewer in to the quotidian and the coruscating, the mundane and the magnificent, as his latest feature seamlessly fuses elements of murder-mystery, family drama and morality play into a meditation on modern-day life. Featuring as protagonists the superb Peyman Moadi and Leila Hatami as a husband and wife undergoing a separation in modern-day Tehran, Farhardi rapidly traces the outlines of a marriage under stress. On one side is an elder parent with Alzheimer’s (sympathetically portrayed by Ali-Asghar Shahbazi), balanced on the other by the couple’s hyper-aware daughter (Sarina Farhadi, the director’s daughter in real life). The daily challenges of the modern day (looking after Dad, picking up daughter after school, rushing to and from work, finding a care-worker) are rapidly sketched, and serve as the planks on which Farhadi builds his platform for a deeper purpose. Just when the audience thinks they are watching the Iranian equivalent of a Mike Leigh kitchen-sink drama, Farhadi deftly spins the plot into a bewitching mix of mystery (accident or deliberate? homicide or murder?) and morality (to tell the truth if the outcome is illegal or unfair?) Overlaid on all of this is the deeper question of the role of religion in modern life. In the hands of a lesser auteur such issues might become portentous, pretentious, or both, but Farhadi is adept at keeping the viewer on the edge of their seat as the plot twists and turns, from one family to the other, one death to the other, one love story to another. Farhani excels at evoking sympathy for all his characters (the daughter stays with Dad, while Mom is the one who leaves the home; the woman who comes in as care-giver is from a poor family; her husband is out of work; their two children play together); Just when one feels one’s sympathy ebbing for a particular character (is Mom heartless for leaving her daughter behind? Is Dad a snob for treating the caregiver badly? ), the director deftly switches point of view so that one sees the motivations of each of the major characters in an entirely new light. Embedded in all of this is a cascading series of love stories, between husband and wife, parent and child, families and children, each one of which is thwarted by the inadvertent actions of the other. Farhardi shows us how the best intentions of one can be constantly and consistently misread by the other, leading down a rabbit-hole of pain and sadness. As evocative as Bergman, with more twists than Hitchcock and all the empathy of Leigh, Farhadi has written, produced and directed what will surely over time be recognized as one of the great films of the decade. It is a testament to his powers that this film has an 8.6 rating on IMDB and a 95 score on meteoritic.